The author is the former Director of Aratoi–Wairarapa Museum of Art and History in New Zealand. He served as Exhibition Developer and Project Manager for the exhibition, Te Marae o Rongotaketake: Redressing Our Kahungunu History. On April 8, 2017 the exhibition, Te Marae o Rongotaketake: Redressing Our Kahungunu History, opened at Aratoi–Wairarapa Museum of Art and History in New Zealand. It is scheduled to run through September 3, 2017. 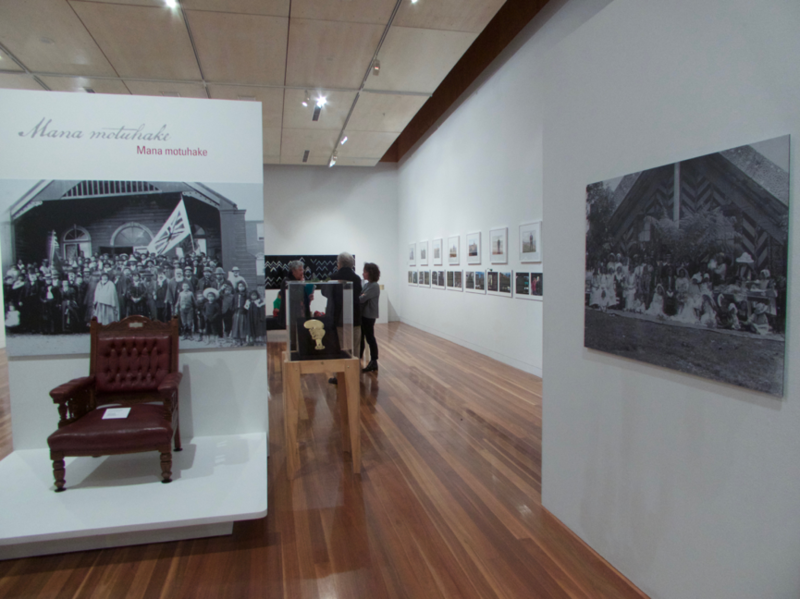 The exhibition’s primary objective was to cultivate public awareness around the redressed history of the Ngati Kahungunu, a Maori iwi (tribal group), whose homeland is located on the east coast of New Zealand’s North Island. Using nearly 200 objects, revised historical accounts, and personal narratives, the exhibition provides a significant platform to narrate the tribal group’s redressed history to multiple publics. The exhibition coincided with the completion of a three-decade long negotiation between the Ngati Kahungunu and the New Zealand government. The lengthy negotiation process involved reaching an agreement to redress the group’s loss of 2.5 million acres of land during the mid 1800s. The negotiations also resulted in financial and material recompense as well as a public apology for the injustices carried out during colonization. Ngati Kahungunu Curator Haami Te Whaiti and the exhibition team were committed to including traditional Maori tikanga (protocols) and indigenous concepts in the exhibition’s structure. The exhibition was preceded by a detailed research program. A grant from the Masterton Trust Land Trust supported an extensive survey of the iwi’s objects housed in national and international collections. The survey resulted in a database listing Kahungunu objects, locations, and conditions. Not only was the database’s creation empowering to the Ngati Kahungunu, it also provides a resource available long after the exhibition closes. Using the database, the exhibition organizers selected taonga (cultural treasures) that were critical to their heritage, and that allowed them to redress a contested period in their history. The exhibition featured approximately 200 objects from ten museum collections, bringing together the largest number of Kahungunu objects to be assembled in one site. During the exhibition’s research phase, a significant cultural object — a carved wahaika (ceremonial club) — resurfaced in the collection of the Fowler Museum at UCLA. The discovery of the wahaika offered the Ngati Kahungunu the opportunity to reconnect with a significant tipuna (an ancestor) who played an important role in their disputed colonial history. What follows is a summarized account of the wahaika’s creation and departure from New Zealand, its disappearance for over 100 years, its return to New Zealand, and its reconnection back into its community of origin. This carved wahaika belonged to Tamahau Mahupuku (1840-1904), a distinguished leader of the Wairarapa Maori during the late 19th century. In 1904, Mahupuku’s widow gifted the wahaika to Lord Ranfurly (New Zealand Governor from 1897-1904) on his final visit to Wairarapa before his return to England. The wahaika was fashioned by Jacob Heberley, a skilled and prominent carver of Te Atiawa descent who lived in the Wairarapa periodically during the mid to late 19th century. 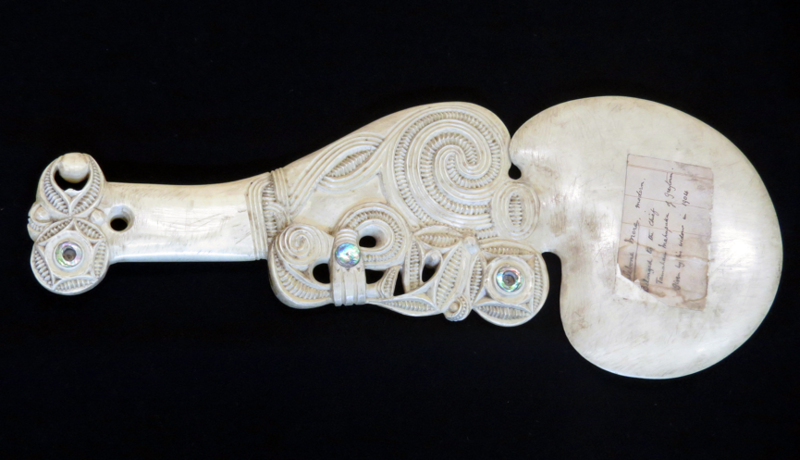 Located at the base of the handle is a manaia (stylised figure) holding a whatu (stone) in its mouth. This peculiar design feature is characteristic of Heberley’s carvings and found in a number of his other patu (clubs). Interestingly, the wahaika was carved from celluloid, a form of plastic introduced in the late 19th century as a substitute for ivory and especially the whalebone from which ceremonial clubs were made. Celluloid was also used for small objects such as piano keys and the so-called “bone”-handled knives, and later to make the celluloid film used to create movies and photographs. After the gifting ceremony, Lord Ranfurly returned to his estate in Ireland where the wahaika was deposited into the trophy room of his manor house until 1922 when the contents of the home were auctioned off, probably due to the estate falling on hard times during the Great Depression. Most of the home’s contents were auctioned to agents of Sir Henry Wellcome, the pharmaceutical magnate, and the wahaika was moved to Wellcome’s estate in London. It sat amongst other artifacts from 1922 until 1965 when 15,000 objects, including the wahaika, were gifted by the Wellcome Foundation to the Fowler Museum at UCLA. For fifty more years Tamahau Mahupuku’s wahaika remained largely unseen in the Fowler Museum’s collection storage until it was identified during the Kahungunu research and artifact survey in 2015. 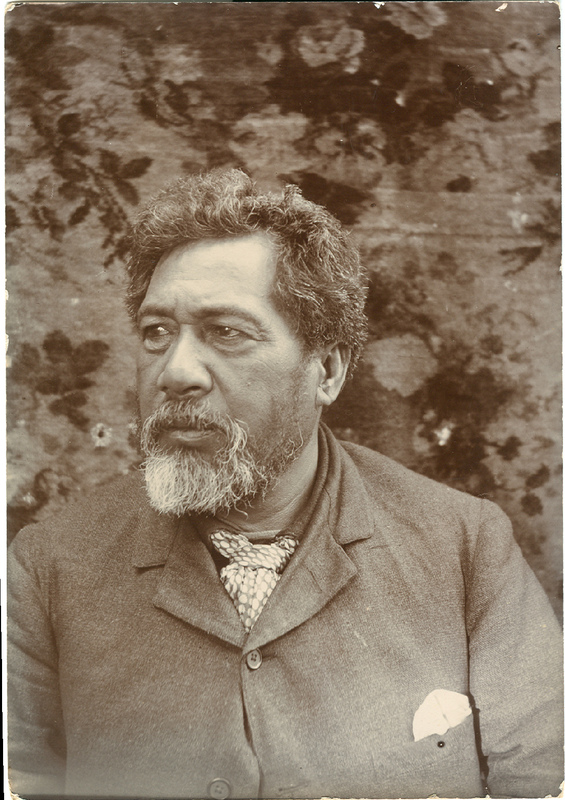 Locating the wahaika in the Fowler Museum’s collection was a pivotal event for the Ngati Kahungunu. The possibility of the taonga returning, even temporarily, to its community of origin and its inclusion in the exhibition would be significant historical, cultural, and political interventions. Once the wahaika was identified in the Fowler’s collection, Curator Haami Te Whaiti and Aratoi–Wairarapa Museum initiated discussion about the possibility of a loan request with the Fowler Museum. Around the same time, the Fowler carried out its own research on the wahaika. The Fowler’s conservator discovered that the object was not made from whale bone, as described on the museum label, but instead was made from celluloid. This new information removed administrative complications around the movement of ivory and bone across borders, allowing the object a smoother path to travel from the Fowler Museum in Los Angeles to the Ngati Kahungunu exhibition in New Zealand. Discussions continued on logistical arrangements and loan details. Receiving an international loan request for a significant cultural artifact from an indigenous group raised some concerns for the Fowler Museum who queried if the loan was temporary or part of a repatriation process. From the viewpoint of the Fowler Museum Trustees, the wahaika was gifted to them in 1965 and thus possession and ownership of the object sat firmly with them. The Trustees requested confirmation that the wahaika was not staying in New Zealand any longer than the loan request specified. The Fowler’s position around object ownership is not unusual for a large museum operating in a standard Euro-American model whereby the museum is a corporate entity who owns the objects in its collection. This model is very similar to that used by the Crown in New Zealand after it had coerced land from the Maori in the mid 19th century. After removing collective ownership from a tribal group, the land immediately passed into the hands of a single holder, lost forever into the colonial system of ownership. This model contrasts starkly with complex Maori concepts underpinning land and property ownership. When a taonga is gifted by a chief, a cultural and spiritual link is retained between the artifact and its place of origin. Gifting is two way and open ended, with an object passed from generation to generation building up its own mana (life force). It was this type of tangible and intangible cultural heritage that the iwi wanted to acknowledge and rekindle with the wahaika, and just as importantly, with their ancestor Tamahau Mahupuku. In the hands of the Ngati Kahungunu the wahaika has agency and efficacy and, as such, it exemplifies a type of personhood. In the Fowler’s collection, the wahaika was enmeshed largely in dominant western museum discourse about cultural objects belonging to indigenous peoples. The Fowler’s concerns about ownership and repatriation of the wahaika were alleviated after additional discussions with the Ngati Kahungunu. Eventually a sense of trust was established between the two parties and the Fowler returned the object back to its community of origin as a loan, enabling an indigenous process for the Ngati Kahungunu to take place, a beneficial act in which the museum could participate. Rediscovering and reconnecting to the wahaika was significant to the Kahungunu. They began planning and preparations to welcome it back onto the same marae (ancestral meeting grounds) where it was gifted to Lord Ranfurly. Final details and travel dates for couriering the wahaika from the Fowler Museum to New Zealand were confirmed and in November 2016 the wahaika was accompanied from Los Angeles to New Zealand by Roy Hamilton, Senior Curator of Asian and Pacific Collections at the Fowler Museum. 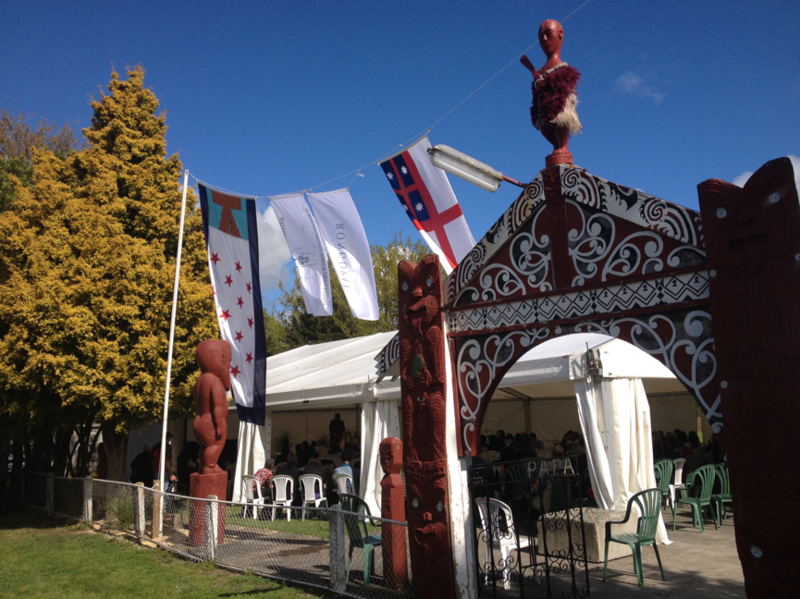 Arriving onto the Papawai Marae in Greytown, the taonga was greeted with an emotional welcome from Tamahau Mahupuku’s descendants. His wahaika had come full circle, it was now reconnected back to the place from where it was gifted and was now set to be displayed in the exhibition, Te Marae o Rongotaketake. Papawai Marae, site of the 1904 gifting and the 2016 return and reconnection of Tamahau Mahupuku’s wahaika. Photo by author. After the pohiri (welcoming ceremony) the conversation and information sharing between Tamahau Mahupuku’s descendants and the Fowler Curator Roy Hamilton flowed back and forth. The wahaika was then transported to Aratoi-Wairarapa Museum and deposited into the collection’s storage where it awaited inclusion in the exhibition. Excitment about the wahaika’s arrival was palpable. Its return was not only about the cultural value of the wahaika, it was also about the spiritual presence of an ancestor returning home with the taonga. To the Ngati Kahungunu elders, the gifting of the wahaika to Lord Ranfurly was part of a traditional process, involving a deep cultural connection between the taonga and Tamahau Mahupuku. The return to Papawai Marae solidified the connection. The wahaika on display next to Tamahau Mahupuku’s chair from the Maori Parliament at Papawai. Photo by author. The Fowler Museum showed understanding and diplomacy in providing the Ngati Kahungunu the opportunity to reconnect with Tamahau Mahupuku’s wahaika. Acknowledging the Ngati Kahungunu as the living culture connected to this cultural heritage enabled the iwi to re-establish their spiritual and cultural custody of the artifact. It also gave them the opportunity to research, interpret, and present their own cultural objects and history. The return of the wahaika after more than 100 years of absence completed the circle. This important object was welcomed back by its waiting people, emphasizing the persistence of lived experiences and the continuity among generations. The process of reconnection meant more than just surrounding the object in its indigenous context and history. Such reconnection can only happen when heritage or tradition is connected to the experience of everyday life as discovered through the contemporanaity and voices of the indigenous people themselves. Copyright © 2019 Mapping the Arts of the Oceanic World. Powered by WordPress. Theme: Accelerate by ThemeGrill.